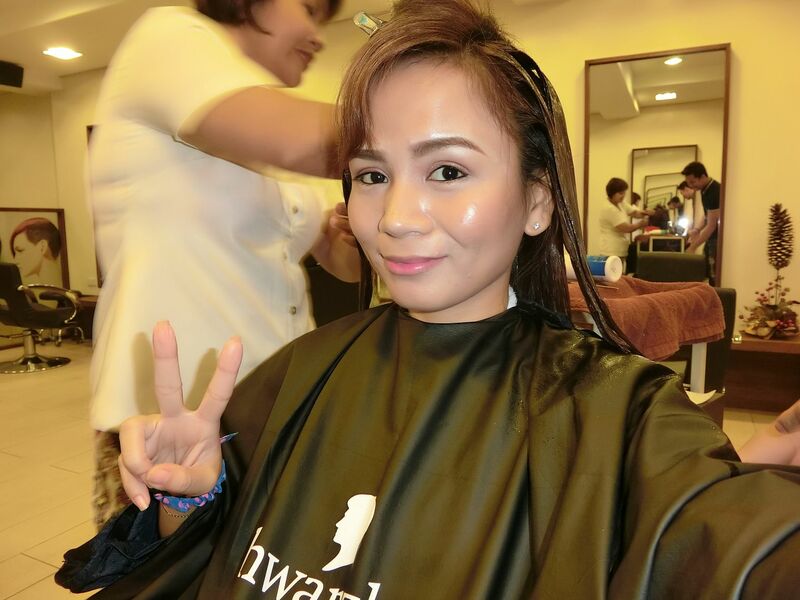 One of the things I can't live without, aside from food, is definitely hair rebonding! 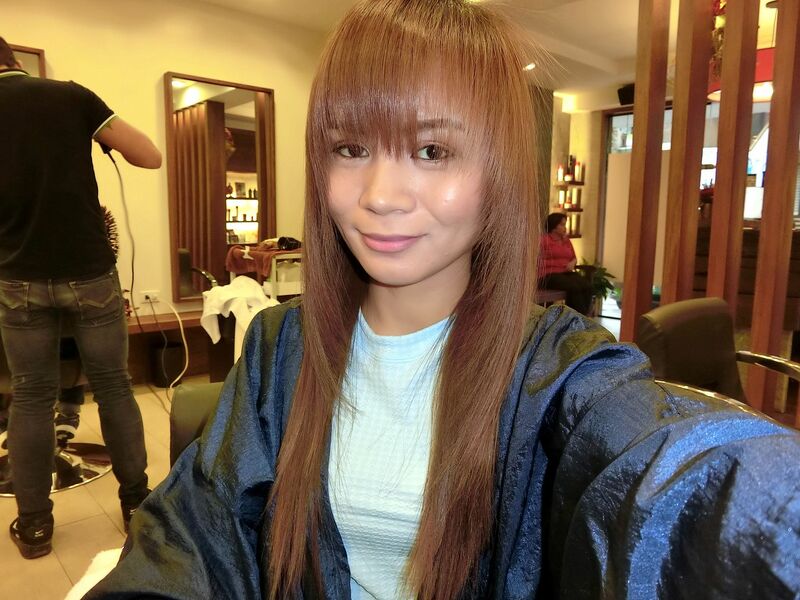 Hair Rebonding is a chemical hair straightening treatment that "bonds" the hair to leave it looking straight, soft and shiny. It can straighten even the curliest or kinkiest hair! I used to have beautiful black and straight hair as a child but I remember my hair got so damaged when my aunt did a lot of treatments on my hair back in elementary school. Since then, my hair never became healthy and naturally straight again. When I was in college, I discovered the magical hair rebonding treatment! Since then, it has become my routine to get this treatment once or twice a year. 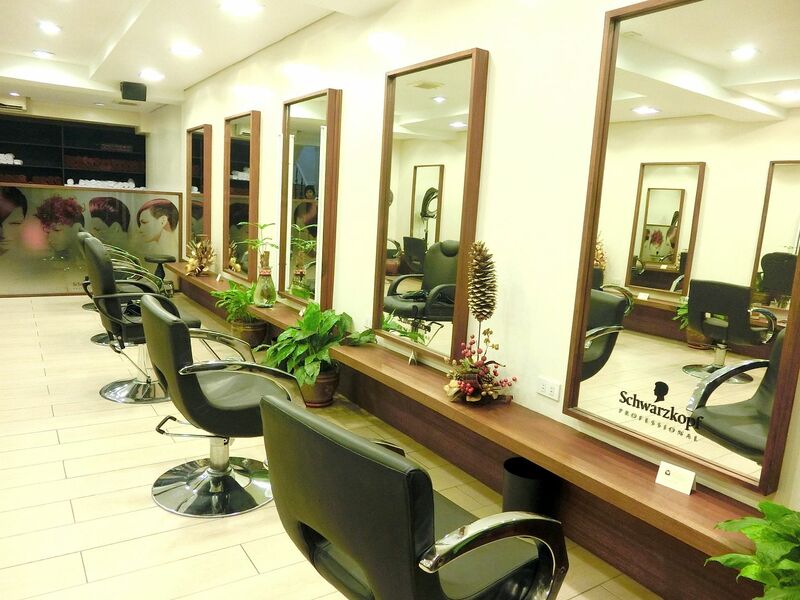 I have tried many salons, some of them were great while some of them were a miss. 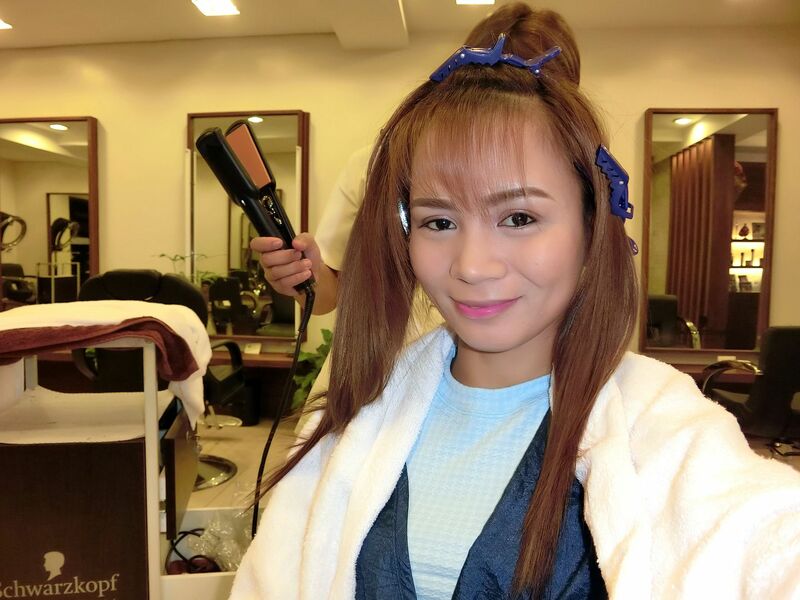 This time, I tried Cedar Salon's Hair Rebonding treatment for the first time! Was it a hit or a miss? Keep on reading to find out! 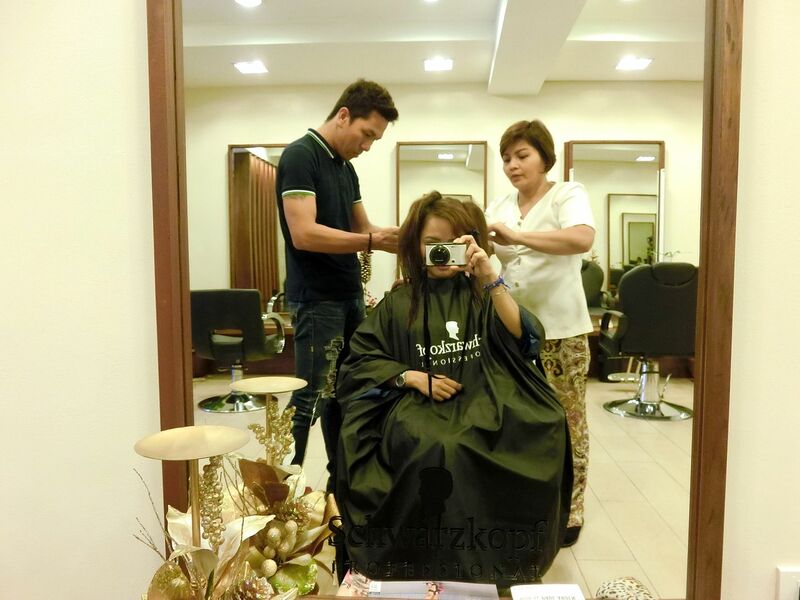 Cedar Salon is located at 200 Wilson Street, San Juan, Quezon City. It is a few blocks away if you are coming from Greenhills. What I like about this salon is the calming vibe. 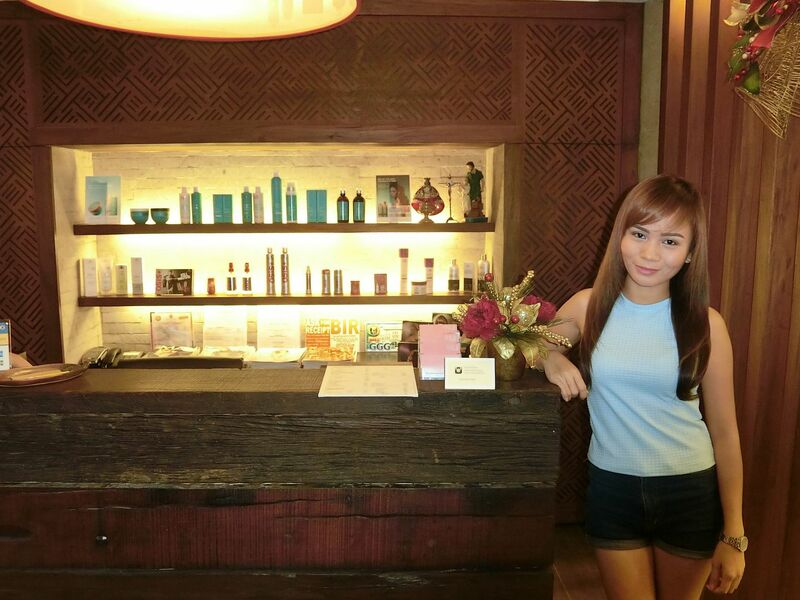 The ambiance is sophisticated and calm, truly a great place to get pampered! Anyway, I knew the treatment was going to take at least 5 hours, so I made sure to bring a book with me. Back to the treatment, if you've never had it I am sure you are wondering why the treatment takes such a long time. It's because the hair stylist needs to work on your hair intricately. The hair must be ironed in tiny sections to ensure that the entire hair is sleek straight! Good thing, two people worked together on my hair. Here's Cedar Salon's hairstylist, Jake and his partner for the day, Belen. I am embarrassed to show this photo to you guys, to be honest! Since I mostly check my front view in the mirror, I didn't know that my hair was actually this worse! Ackk! The last time I had hair rebond was in January 2015, so of course, regrowth would be dry, frizzy and ugly again! FIRST STEP : The first step is to wash the hair to make sure there are no hair products prior to the treatment. Then, it will be blow dried and then will be divided into sections. The hair straightening cream will now be applied on it. This will be left on the hair for about 20 minutes. If your hair is "virgin", the stylist could treat the entire hair with the straightening cream. If you had hair rebond before, it is suggested that you only have your roots or regrowth treated to prevent any further damage to your hair. SECOND STEP : The second step is to wash the hair thoroughly and then to blow dry it once more. Again, it will be divided into small sections and now the stylist will proceed to ironing the hair. I have never tried rebonding someone's hair before but I do iron my hair and I know how painstaking it could get to try to straighten each section to make it look perfect! That is why this part takes the longest to do. What I don't like, though, is perfectly straight hair without shape or volume. I just hate the "broom" look on hair! So, I asked the hair stylist to iron my hair inward so the tips get some shape. THIRD STEP : The next step is to apply "neutralizer" on the hair and leave it on for another 20 minutes. After that, the hair will be rinsed once more. If you availed of any hair treatment, this is the time where the stylist would apply it on your hair and then leave it for some 15 minutes. 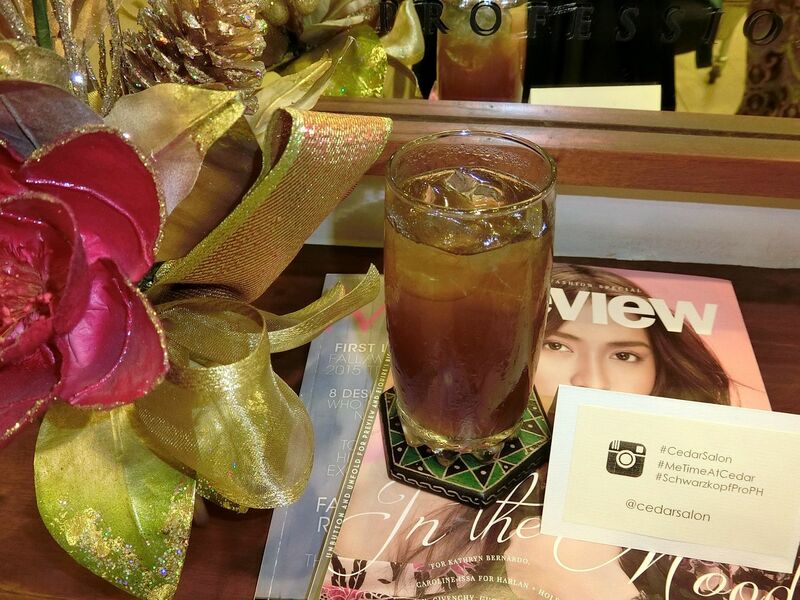 What I liked about Cedar Salon is that it is a Schwarzkopf salon. Meaning they only use the famous brand for all their hair treatments! None of the creams hurt my scalp or stung my eyes and nose! It was so good! FINAL STEP :The final step is to blow dry the hair. Some stylists might even iron it a bit to achieve the final shape or straightness that you desire. You will then be asked not to wash your hair for at least 3 days to make the chemical "bond" your hair further. And, voila! Here's my hair after 5 hours being on the chair! Perfect, beautiful, flawless straight! I love that the hair stylists listened to me and gave my hair some volume. As I have mentioned before, don't you guys hate it when you have to fight with a hair stylist just because he/she won't listen to what you really want to do with your hair? I am so glad that I liked the result! Straight crown and bangs yet volumized and shaped ends! How do you guys like it? I do like it, for sure! 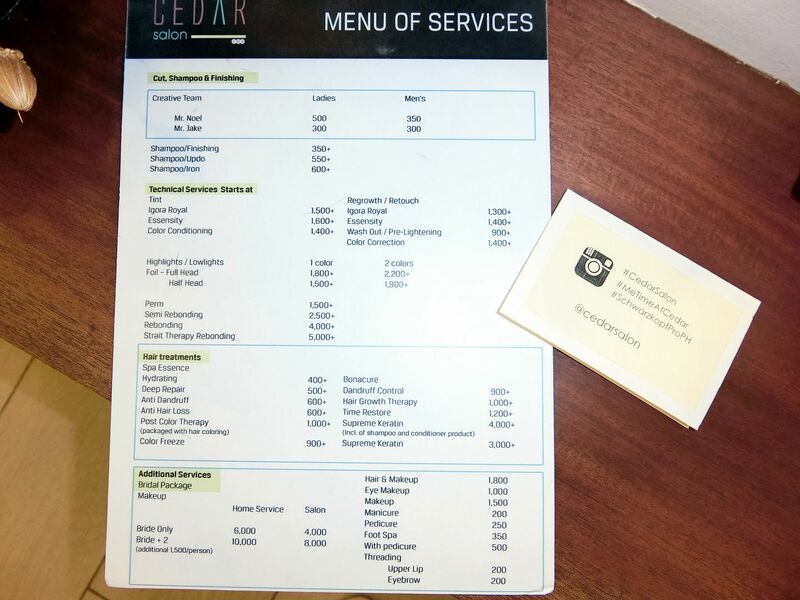 If you are interested to avail any of Cedar Salon's Services, kindly click on the photo to see the prices of their treatments. Follow them on Instagram, @CedarSalon if you want to know more. 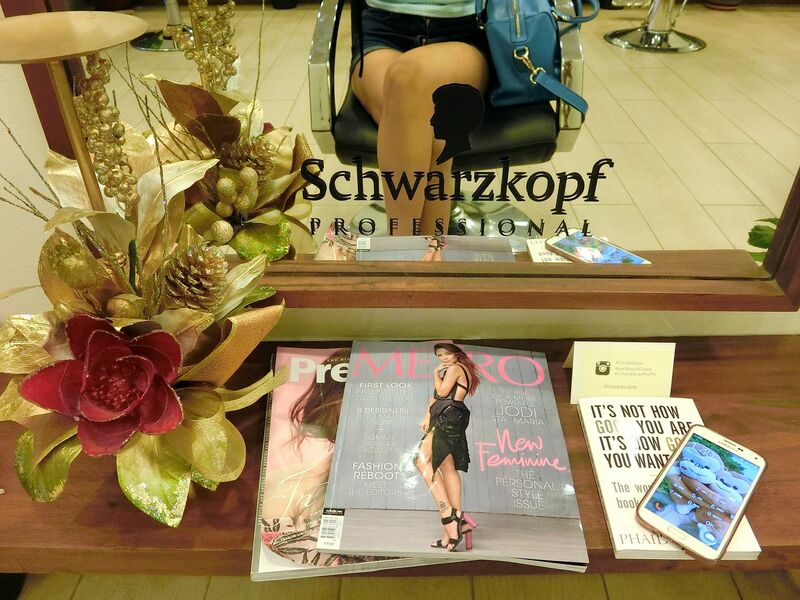 I definitely give this salon a thumbs up! 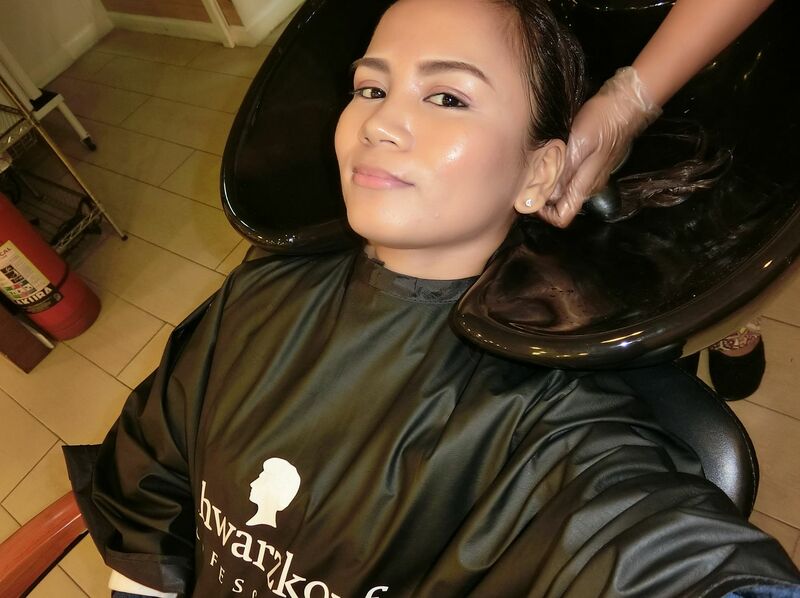 I really liked their hair rebonding service and would definitely go back for another hair treatment! Thanks for reading today! I want to know what you think of my new hairstyle. Oh, I noticed that the hair rebonding kind of made my hair color ligthen a bit. I would like to know if you guys prefer me with my old light brown/blonde hair (Balayage, perhaps?) or if I should go dark and black all the way? I will re-color my hair soon so please let me know your suggestion! Don't forget to follow me on Instgram. I'm only a few "follows" away from hitting 5,000!  Make it happen for me, please? It's @RealAsianBeauty.